Valentine's Day Makeup Look: Featuring NYX Love Contours All Palette! With Valentine’s Day just one week away, I thought why not create a Valentine’s inspired makeup look? I asked twitter whether they wanted to see this in a video or a post, and I got a mixed response, so I decided to do both! Firstly, you want to prime the face! I used wonderland makeup’s primer because I really like the flawless and poreless finish that it gives me, but you can use absolutely any primer. Then we need to prime our eyes! I used the makeup revolution primer which I would recommend for keeping shadows put because it dries tacky, so the shadow literally sticks to the primer! But like I said in the video, you can just use concealer for this if you don’t have a primer. Next it’s eyeshadow time! So we are taking the star of the show (the NYX Love Contours All palette) and applying the lightest purple/brown shade to our crease, I like to use a fluffy blending brush from BH cosmetics for this. Next we take the darker purple and blend this on the outer corner of our crease. Finally we take the darkest purple and really concentrate this into the crease, blending out towards the outer corner. Up next, we need to pack on the gorgeous metallic purple shadow. I use my finger for this as I find that I get a better colour pay off, and then I use the same BH cosmetics brush to blend. Then take a little bit of the silver/purple highlight shade and dab this into your inner corner using your finger to highlight and define! Taking a smaller brush, we want those darker purple shades that we used earlier. Here I use the brush to carefully underline my eye with these shades, as I find that it makes the look look more finished! First we’re going to conceal using the makeup revolution concealer. I use this mainly under my eyes, and on any problem areas. For blending, I’m using my damp real techniques sponge and dabbing in the product, rather than wiping it in. Then I’m going to use a mix of the NYX and Lancome foundations to get a glowy, dewy finish as well as full coverage. Again, I’m going to dab these in with my real-techniques sponge. For contour, I’m using the sculpt and highlight duo by NYX, and creating shape and definition in all the areas which I desire. Then I’m going to blend this again using the same sponge, before further defining the contour with the NYX Matte Bronzer. For highlight, I’m going to take the same iridescent purple shade that I used to highlight the inner corner, and apply this with a morphe angled brush. Next, I’m going to fill in my brows using the NYX brow pomade and an angled brush. This is really good for sculpting and defining the brows that you already have! Then I’m going to take the lighter brow shade from the Love Contours All palette just to add a little bit of dimension. Lash time! I’m using the Ardell wispies which are absolutely perfect for a Valentine’s Day look because they’re so long and fluttery! I prep my lashes with the Rimmel Wonder’fully real mascara first, and then apply the wispies! 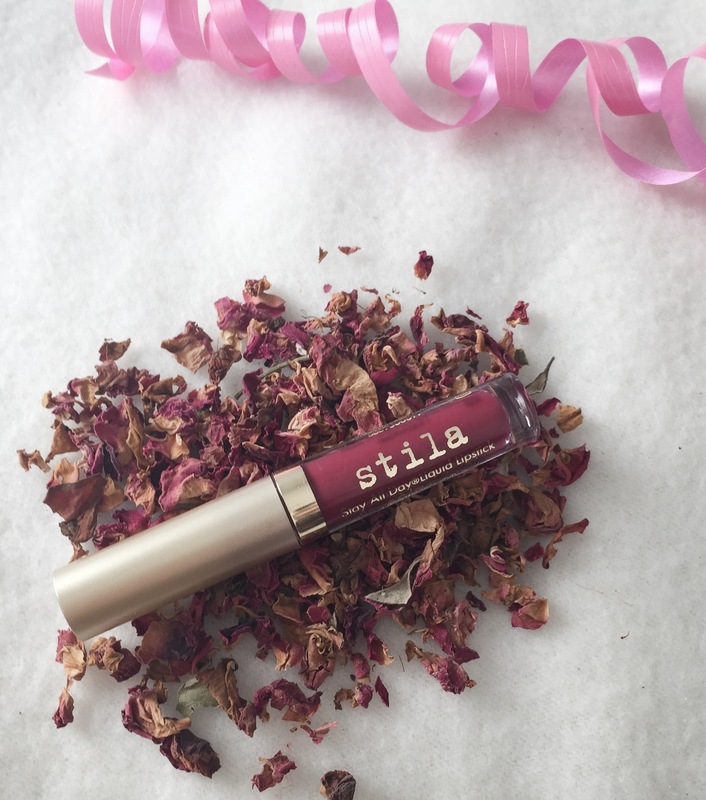 Finally, I’m going to use the Stila Stay All Day Liquid Lipstick in shade Bacca on my lips! This is the perfect statement lip for valentines and it really does stay all day, no matter how much kissing takes place ;). And there we have it! What do you think of my finished look? Let me know in the comments! *Products marked with an asterisk (*) were sent in exchange for review. For more information, see my disclaimer.